The Middleton can be found about 1.4 miles north of the town centre on Holmfield Road on the North Shore. 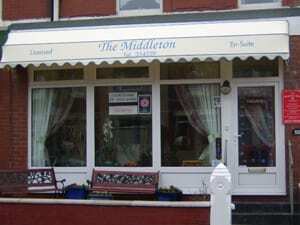 The Middleton is a three star-rated Visit England guest accommodation that can be found just two minutes from Glynn Gardens on Blackpool’s North Shore. Exciting attractions like the Pleasure Beach, Sea Life Centre, opera house and Winter Gardens are just a short tram ride or walk away. Owners Terry and Jan run a very tight ship and always ensure that the Middleton is kept clean and tidy at all times. The entire hotel is centrally heated throughout the winter months so you can be assured that it’s always warm and toasty when it’s cold outside. All rooms are en-suite and serviced every day of the week and we always ensure that bedding and towels are clean and fresh all the time. 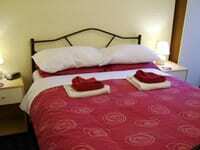 Included in the rooms are the usual mod cons including colour TVs and facilities for making cups of tea and coffee. 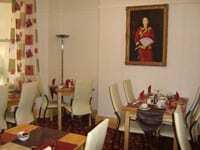 Excellent home-cooked dishes are provided in our welcoming dining room where guests are given the option of a hearty full English breakfast or cereals and juice in the morning. We also cater for guests with special dietary requirements as long as prior notice is given. 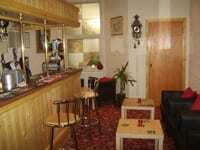 In The Middleton, we offer a wide variety of ales, and popular spirits in the fully-licensed bar. We hope you will enjoy socialising and relaxing with us. At the Middleton, you are also assisted by the added benefits of free Wi-Fi so you can surf the internet during your visit and the availability of late keys so you can stay out late and enjoy Blackpool’s vibrant nightlife. For up-to-the-minute information about our tariffs and all other enquiries, get in touch with us today or click on the website link for details. Place Categories: North Shore, North Shore Couples and North Shore Families.